The class ‘C’ licence replaced the older class II licence in 1997 and passing the ‘C’ test is the first step on a career as a driver of large goods vehicles (LGV). Prior to attending a driving course for the acquisition of the ‘C’ licence you must obtain a provisional licence, medical and theory test pass required prior to training. McPherson Training are able to advise on these steps, just give us a call. 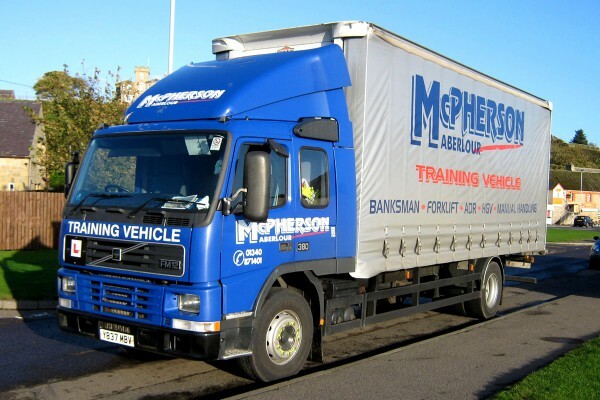 CLASS C – Rigid Lorry over 7.5 tonnes : 4 days practical training in McPherson Training vehicle, Driving Test on 5th Day. This allows you to operate a ‘Rigid’ vehicle over 7.5 tonnes, and on successfully passing the test includes the provisional entitlement for a C+E licence. The practical courses are delivered following the DVSA recommended LGV Syllabus for learning to drive LGV’s. Our Registered instructors have the most up to date information available to ensure you are properly prepared for the LGV test. The vehicles we use are maintained to the highest standard and fully meet the DVSA specification, this means we ensure you have the right skills and the right vehicle to achieve the licence you require. We also ensure that you have the skills required to start work driving LGV’s after passing the LGV Driving test. Training is delivered in a variety of traffic situations including urban and rural driving. Individual requirements are taken into account and training is structured to suit your personal needs and your best pace for learning. Off road maneuvering is practiced at our dedicated training centre to ensure you are ready for this important part of the LGV test. Our comprehensive and intensive training course includes familiarisation of typical test routes for the test centre you will be attending, this ensures you have no surprises on the day. While no training provider can guarantee you passing the DVSA test we are proud, and pleased, to announce that our first time pass rate is almost double the UK National average.